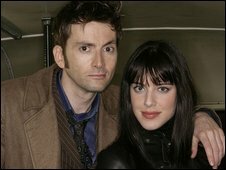 Former EastEnders star Michelle Ryan and comedian Lee Evans will guest star in Doctor Who's Easter special, the BBC has confirmed. "I'm a huge fan of Doctor Who and very excited to be joining David Tennant and the Doctor Who team," she said. Evans plays a character called Malcolm, whose life becomes connected to the Doctor's in unusual circumstances. Planet of the Dead is the first of four Doctor Who specials, marking the end of David Tennant's tenure as the Time Lord. Ryan is best known for playing Zoe Slater in the BBC One soap and starring in the American remake of Bionic Woman. Recently, there has been speculation that she could be cast as the Doctor's new assistant, when Tennant's replacement, Matt Smith, takes on the role next year. It is not known whether this appearance rules her out of that role - Catherine Tate's character Donna Noble first appeared in a Doctor Who Christmas special 15 months before she returned as the Doctor's assistant. Ryan said: "It is such a fantastic show and I can't wait to get started." Executive producer and writer Russell T Davies said: "Michelle is one of the most sought-after young actors in the country and we are delighted to announce that she will be joining the team. "As always the script is being kept strictly under wraps. However, we can reveal that Lady Christina is a woman with a mysterious past who's going to have a huge impact on the Doctor." Filming on the episode has already begun in Wales.